The twenty-second round of the English Premier League season got underway on Jan. 1. Brighton hosted Bournemouth at the Amex Stadium. The match started early, with a 12:30 p.m. kick off. The home side taking an early 5th minute lead when a left wing cross was played on the Jose Izquierdo to find an onrushing Anthony Knockaert unmarked at the far post inside the 6 yard box, driving into the unguarded net with Asmir Begovic stranded at the near post, Stephen Cook heading the equaliser for Bournemouth in the 33rd minute when connecting with a header at the near post from a right wing corner kick and guiding it past goalkeeper Matt Ryan and into the top left hand corner of the net off the underside of the bar, Brighton re-taking the lead from Glenn Murray’s 48th minute strike after Jose Izquierdo set him up after receiving a pass from Pascal Gross, and then Bournemouth grabbing an equaliser in the 79th minute for a 2-all draw when Callum Wilson forced the ball into the net following a goalmouth scramble. Burnley entertained Liverpool at Turf Moor, with Liverpool leaving Philippe Coutinho out of the match day squad, and losing Mohamed Salah to injury, both sides struggling to adapt to the wet and windy conditions, Liverpool taking the lead in the 61st minute when Sadio Mane collected a cross and swivelled before firing a shot into the top corner of the net, a spell of end to end play culminating in Burnley equalising in the 87th minute when Taylor’s cross was flicked on by Sam Vokes for Johann Berg Gudmundsson to stoop to head the ball into the net, but Liverpool fighting back with a 94th minute injury time winner when a free kick into the box from mid way in the half was headed goalbound by centre back Dejan Lovren, and headed over the line from on the line by centre back partner Ragnar Klavan, possibly offside, for a 2-1 victory which lifted Liverpool to the same points as Manchester United before their later game. Leicester City hosted Huddersfield at the King Power Stadium, with both sides appearing to suffer fatigue from the demands of the Christmas schedule in a first half ending scoreless, City taking a 53rd minute lead when Riyad Mahrez produced a sidefoot volley from the right side following Marc Albrighton’s hooked pass, Mahrez then releasing Islam Slimani with a ball over the defence that he lobbed over advancing goalkeeper Jonas Lossl into the net in the 60th minute, City introducing substitute Adrien Silva after his 4 month wait after being deemed to have missed the August transfer deadline by 14 seconds, and then capping off an emphatic 3-nil victory when Marc Albrighton tapped in Demarai Gray’s 92nd minute cross from 2 yards. 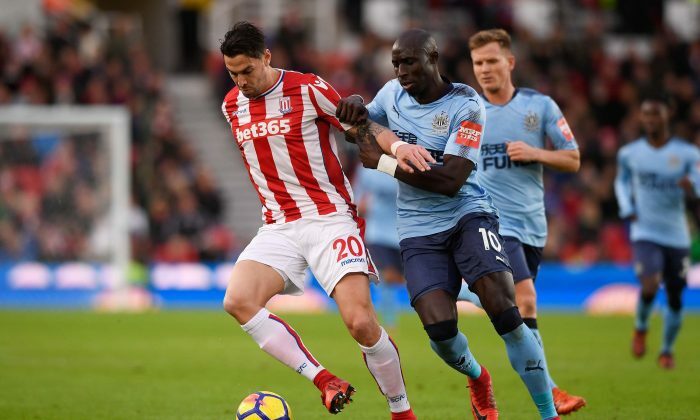 Stoke entertained Newcastle United at the Bet 365 Stadium, the home side showing little of the spark expected as a result of manager Mark Hughes’ decision to rest several key players for Boxing Day’s 5-nil thrashing at Chelsea, though the wet and windy conditions proved a difficult obstacle for both sides, and the visitors missing a number of first half chances to Christian Atsu and Ciaran Clark’s opportunity with the game being settled with Ayoze Perez’s 73rd minute strike for a 1-nil Newcastle win, a result that led to booing and an early walk out from disgruntled Stoke fans, with several exhibiting signs and banners calling for Hughes’ removal as manager, with Stoke now 16th and 2 points above the relegation zone. Wednesday sees the completion of the round with Arsenal hosting Chelsea at the Emirates Stadium.